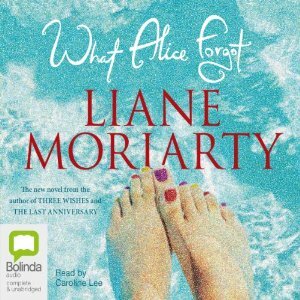 What Alice Forgot by Liane Moriarty is the second book I have 'read' - listened to and I liked it very much. The narrator does an excellent reading and enhances the whole experience. I am going to actually read my next book by this author in paperback. I am wondering how that will stack up against the audio experience. Alice hits her head at the gym and when she comes to, she has lost the last 10 years of her memory, so now she thinks its 1998. A lot of water has gone under the bridge since then! Most of the book is about Alice trying to grasp who all these unknown people are in her life. First of all her children - she thinks she is pregnant with her first child - but no, she has three! She has a friend that it appears she has lost touch with and a friend who has died - and she has no memory of her. She finds that her husband Nick and herself are separated, heading towards divorce. The house they bought is now all perfectly renovated. And that's not all, her mother has done something very unexpected, and Alice seems to have a man friend - Dominic the local Principal. Elizabeth, her sister seems a little estranged and is dealing with her own problems of infertility. So, the Alice of ten years ago meets the life she is now living ten years later. She finds there are many changes in her life, she is no longer the woman she once was. There are a lot of hard edges that the younger, softer Alice would never have dreamt of developing. Who is Alice now? As she unravels her life, she has choices to make. No more, so as not to give the plot away - although as I have come late to this book, most readers probably know! There are so many heart wrenching issues explored in this book - infertility, divorce, children, marriage, friendships, death and family. It could be a serious, depressing book but its not. There is humour and exploration of what could be and might have been. Like any good author Liane Moriarty keeps you guessing until the epilogue, and she left one satisfied reader behind. I enjoyed your review Kathryn. I loved this book. I'm glad you enjoyed it. I like your cover better than the orange one I had. Thanks Pat, this is the audiobook cover. I must look up the other editions on Goodreads to see your cover! Yes I don't think this one would be for everyone, I have been hooked into this writer's novels by other bloggers! I have had this one on the shelf for a while but haven't managed to pick it up yet. Sounds like I definitely should though! Yes I am now a fan of this author! Yes, another Australian author that I now admire! Your review made this more interesting to me than my first reaction. Thanks for sharing your thoughts. I can't wait to read this! I'm hoping my turn at the library comes up soon.